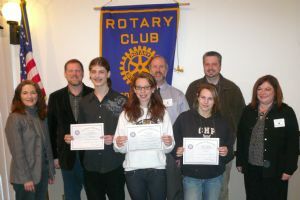 Oak Ridge High School freshman John Haskins won 1st place in the El Dorado Hills Rotary Club Speech Contest on Feb. 10. The theme for this year's speech is "The Future Is in Your Hands." Second place went to sophomore Kaleah Galleguillos and freshman Mia Brower took third. For his performance, John took home $300 from the club, a certificate and a chance to compete at district level in the semi-finals on March 24. Kaleah and Mia received $200 and $100 respectively, plus certificates. This year's judges were David Long, Kristen Strand and Shari Merle. The photo taken after the competition shows, left to right: Rotary President Kathy Witherow, Chris Haskins, John Haskins, Mia Brower, Oak Ridge High School Principal Steve Wehr, Kaleah Galleguillos, Oak Ridge Speech Coach Eric Larsen and Rotary Speech Contest Coordinator Kathe Russell.